JM works with numerous clients who have done considerable research before visiting the showroom. Once they make the decision to redo their kitchen, their hearts beat a little faster. Their cup of adrenalin flows over. We want to help our clients realize their dreams! We had a client with a small kitchen space but wanted to have an eat-in kitchen. We specified a multipurpose table on wheels that could be tucked under an island. This served two purposes — the table could be used for more formal dinner when rolled out, but when tucked in, it served as a breakfast or lunch bar. We helped one of our clients take a cavernous space and make it feel and look more intimate. 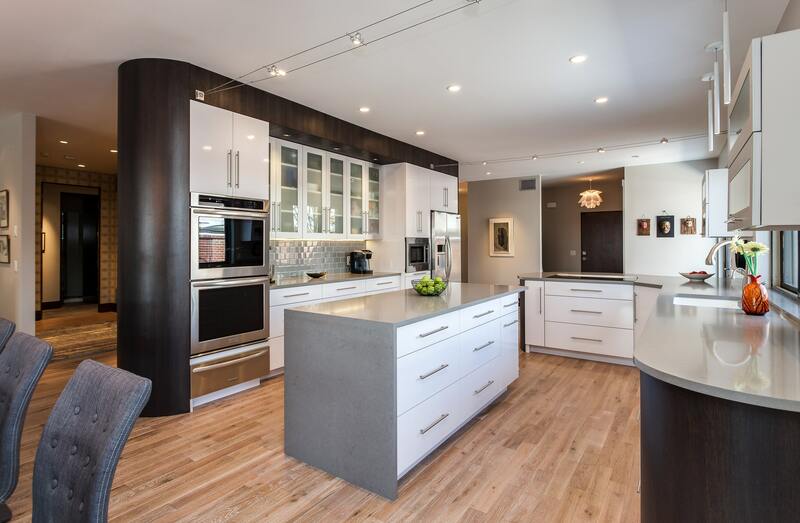 The kitchen featured a soaring ceiling. We use oversized, industrial looking pendants to fill the void and make a pronounced design statement. We also filled a section of the ceiling over the island with copper to provide a sense of intimacy. A client was dissatisfied with the height of their ceiling. We solved their problem by removing the wallboard to reveal raw wood rafters. It made another dramatic design statement while opening up space. A kitchen remodel is a big undertaking. Before you begin we recommend you consider these areas for a successful experience. Code compliance: Ask your showroom consultant the different code requirements that must be met in order to produce the kitchen of your dreams. In many jurisdictions, codes will affect the size and type of range hood or fan and if you will need to update electrical connections or plumbing systems. At JM, we always ask our customers how they would like their cabinets and drawers to open. To achieve a clean, minimalist look in contemporary applications, we may forego cabinet knobs and pulls, replacing them with touch latches that open simply by gently pressing on the door or drawer. Placing hardware on doors and drawers is more complicated than it appears and often depends on the size and type of cabinet selected. Hardware is the jewelry of the kitchen and should not be an afterthought. Cabinet hardware helps to create consistency and elegance. Additionally, one size or style rarely fits all applications. Depending on the style and size selected, some kitchens demand different cabinet hardware sizes and styles. Work with your kitchen designer to determine the direction you want your cabinets and doors to open. 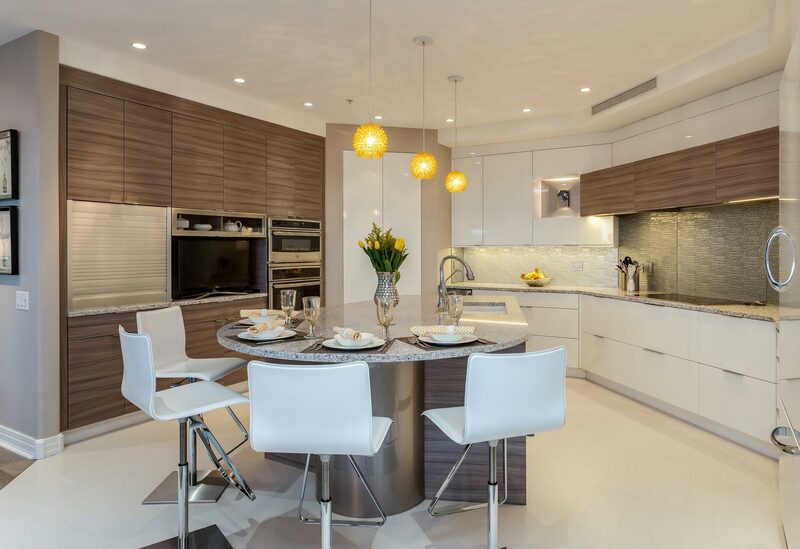 In addition to selecting countertops, backsplashes, appliances, faucets, flooring and paint, your showroom designer should also discuss during the planning process finishes that will achieve your desired look. Granite, stone, and engineered quartz countertops can be polished or honed depending on look and feel that is desired. Honed finishes provide a softer, more organic feel while polished finishes offer a harder appearance. Honed finishes hide scratches better than polished finishes however, they tend to stain more easily than polished counterparts if they are not properly sealed. Make sure that you ask your designer to explain finish options available on the materials that you select and how they impact the look you want to achieve. Stainless or metallic appliances, sinks, faucets and architectural hardware offer multiple finish options. A brushed finish helps to hide water spots and fingerprints better than polished finishes. To achieve a warmer, softer look, consider brass or gold-tone finishes. Stainless and chrome finishes add more sparkle. We also often recommend to clients that they purchase all of their appliances from the same manufacturers to achieve a consistent look. There are different mounting options for sinks that impact the look and feel. Farmhouse sinks typically are deeper than stainless steel under mounted or top mounted sinks. Farmhouse sinks are easier on the back because they bring the sink closer to the user. Many of our clients who do not choose a farmhouse sink, opt for an under mount instead. Under-mount sinks are fastened to the underside of the countertop. This method is used for solid surface countertops such as granite, quartz and engineered stone. The lip where the sink meets counter must be a finished edge. The faucet in this application typically is mounted to the countertop. We advise our customers to decide if the countertop should overhang the sink, if it should be set back from the lip letting the sink show or if the countertop should be flush with the side of the sink. Based on the customer’s preference, we provide direction to the countertop fabricator. Other mounting options are drop-in, flush mount or surface mounted. 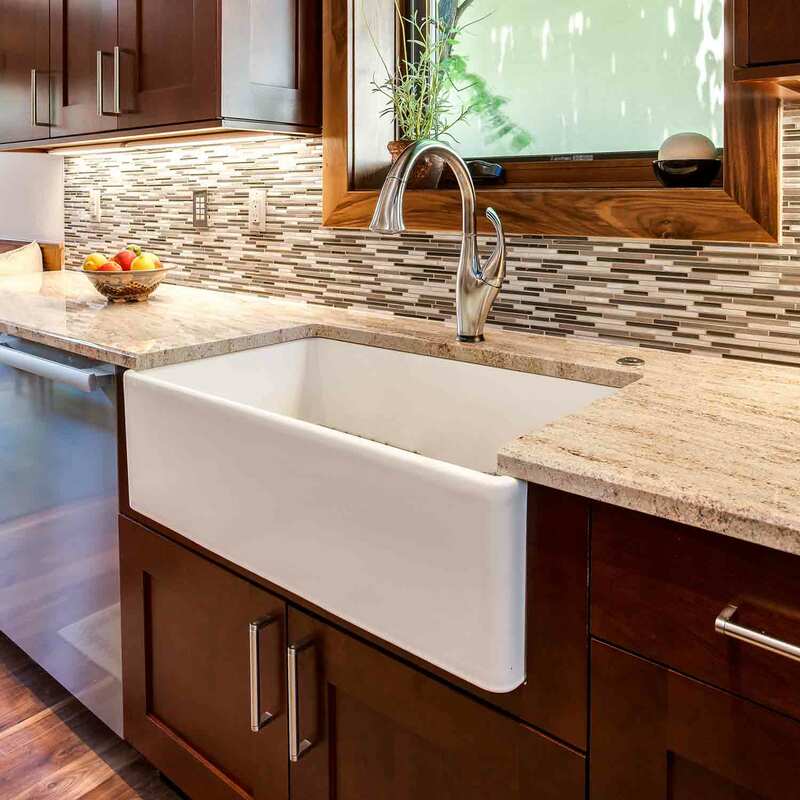 The choice of countertop material affects sink selection. Drop-in sinks have a lip that rests on the countertop surface with an integral rim. In the past, this was the traditional method of mounting sinks, especially on tile. This sink is literally dropped into a cutout in the countertop. Drop-in sinks are often cast iron ringed by a large, raised lip that rests on the countertop surface. Stainless steel drop-in sinks have much flatter lips. Typically, the faucet is mounted to the sink. Flush mounted sinks are set into the counter and align evenly with the countertop material (generally tile). These are referred to as a tile-in-flange. Only a few of our customers opt for a flush mounted sink. Surface mount sinks are installed onto laminate countertops. A hudee rim is a metal frame that provides for a flush installation. It fits around the sink and is held in place by clips. These clips hold both the bowl to the rim and the rim to the counter. Although it’s nearly flush with the countertop, a common complaint is that grime and moisture get trapped on both sides of the metal rim. That’s why we don’t specify a lot of surface mounted sinks. Countertops also have a dramatic effect on the look and feel of a kitchen. Other questions to ask include what shape or style should you use for the edge of your countertops. Rectangular edges often referred to as eased edges, help to create clean lines and are often specified for contemporary kitchens. Those who want a traditional look and feel may opt for more ornate countertop profiles such as a bullnose or demi-bullnose. These are rounded edges. Edge choice also is affected by the material. Consumers that opt for laminate are better served using an eased edge because rounded edges don’t look natural and it is nearly impossible to align seams. Most people erroneously believe that toe kicks need to match cabinets. That may be the case in a number of kitchens, but in white kitchens, you may want to consider another color. Consumers with white toe kicks are often frustrated by the amount of maintenance required to clean them. In many white kitchens, we recommend matching the toe kick color to appliances or countertops. What other questions do you need to ask and answer to ensure a successful outcome? Give us a call, or better yet, visit one of our showrooms in Castle Rock or Denver to see how we can delight you.